Autism spectrum disorder (ASD) is characterized by high rates of comorbid internalizing and externalizing disorders. 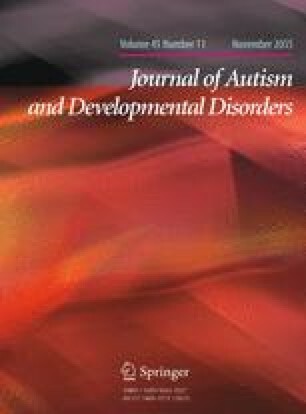 One mechanistic account of these comorbidities is that ASD is characterized by impaired emotion regulation (ER) that results in deficits modulating emotional responses. We assessed neural activation during cognitive reappraisal of faces in high functioning adults with ASD. Groups did not differ in looking time, pupilometry, or subjective ratings of faces during reappraisal. However, instructions to increase positive and negative emotional responses resulted in less increase in nucleus accumbens and amygdala activations (respectively) in the ASD group, and both regulation instructions resulted in less change in dorsolateral prefrontal cortex activation in the ASD group. Results suggest a potential mechanistic account of impaired ER in ASD. The online version of this article (doi: 10.1007/s10803-015-2359-z) contains supplementary material, which is available to authorized users. We thank the clinicians at Chapel Hill Division TEACCH for consultation on the cognitive reappraisal training instructions. Portions of these findings were presented at the 2014 Society for Biological Psychiatry in New York City. We thank BIAC MRI technologists Susan Music, Natalie Goutkin, and Luke Poole for assistance with data acquisition, and BIAC Director Allen Song for assistance with various aspects of this project. This research was supported by MH081285, MH085254, MH073402, HD079124, HD40127, H325D070011, and a UNC-CH Graduate School Dissertation Completion Fellowship (CRD). Assistance with participant recruitment was provided by the Clinical Translational Core of the Carolina Institute for Developmental Disabilities (HD079124).